THE VALERIE FUND is 40 years old! And so, in honor of our wonderful nonprofit foundation established in memory of our younger daughter Valerie, Ed and I gave a speech at THE VALERIE FUND’s eleventh WALK/RUN. It was held at Verona Park in Verona, New Jersey this past June 11th. 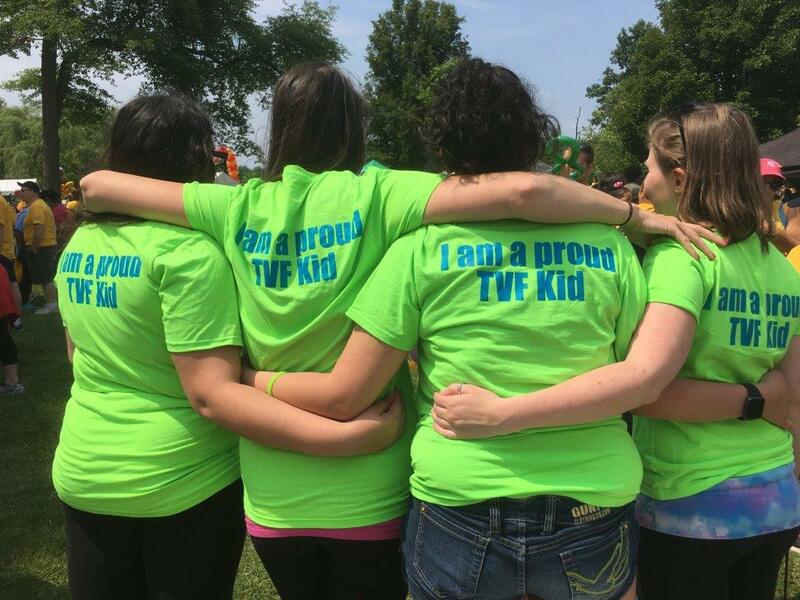 We had loads of sunshine, we spoke in front of a crowd of over 5000 folks and, best of all, joining us were many of our special VALERIE FUND children in their bright green tee shirts with “I’m a Proud VALERIE FUND Kid” printed on the back. The following is our speech … our Frick and Frack donation to all who listened and to those who missed it! I hope you rejoice in all the good things that came our way that day and know that there is more ahead. By the way, the WALK/RUN alone raised more than $5 million dollars over the past five years. Thank you, one and all. Since this is THE VALERIE FUND’s 40th Anniversary, Sue and I would like to tell you, briefly, how we got started and where we are today. When Valerie was diagnosed with cancer she was treated at Babies Hospital in New York. That caused many long and upsetting car rides. Each time, on the way back to New Jersey after her chemo, Val would throw-up into a pot that we had ready in the car for just those occasions. Our anguish was intensified knowing that our healthy child Stacy was separated from us. Through all of Val’s hospitalizations, we saw Stacy only in the early morning or late in the evening. Toward the end of Val’s illness, I saw what a New Jersey regional hospital could do. I had to rush her to the Emergency Room at Overlook Medical Center here in New Jersey but couldn’t park close enough to the hospital’s doors … and I didn’t know how to get Val from the car and into the hospital without jarring her. A security guard standing at the hospital’s doorway saw my predicament and brought out a gurney. He helped me put Val on that gurney and with me by her side, he wheeled her into the emergency room. I will never forget him. I just hope I thanked him enough. For the few days we were at Overlook, I slept on a bed in Val’s room—not a chair—and I ordered my meals when Val did. I didn’t have to leave her to go searching for food. I did not have those luxuries at Babies Hospital in New York. An added benefit was that Stacy was able to visit her sister there. It was an eye opener. Those experiences were the seeds that brought about THE VALERIE FUND. And so, a few weeks after we lost Val, in January 1976, I suggested to Sue that we start a foundation in Valerie’s memory. I also suggested that the 3 of us, Stacy, Sue, and I, go away for a week to clear our heads. Again, I could only think, “It was too soon!” I did not want to go. Despite the misgivings, off we went to Curacao – had a miserable time – came home and created a list of people who had started their own nonprofit foundations. do it; it won’t work. They said it was too hard: too hard on the family and too hard on the marriage. So … we did it. We called a meeting of our friends and asked them to bring their friends and told them we wanted to raise money for children with cancer in New Jersey. At that time, there were no pediatric oncology centers in the state. We set up chairs in our living room. I bought cookies and soda and made iced tea. One friend told me that my iced tea tasted like white fish. Never served that tea again. The group of folks that came to our house were very interested in our concept so we started a search committee that ended at Overlook Medical Center. We made a two-year commitment of $25,000 to support our first VALERIE FUND CHILDREN’S CENTER. Of course, we didn’t know where the money was coming from but we would worry about that later. Our first fund-raiser was a picnic held at Camp High Hills in Warren, New Jersey. We charged $10 per person and $25 per family. We prayed for a sunshiny day and we got it. Over 400 people showed up. It was great. And we netted $3575.00! Our next fund-raiser was a major step up. We decided to hold a Sports Roast at a facility that seated 750 people. But we ended up selling over 1400 tickets! That night 1100 people showed up and we seated them all by adding more tables till there wasn’t an inch to spare in the room. Thank goodness no fire inspector came. On the afternoon of the Roast, before we could seat anyone, the dining room had to be made Valerie Fund-ready. The room was huge but there was a bunch of us workers putting flowers, journals, and balloons on the tables and dais and the work went quickly. When we finished, I took one last look around and saw only this vast empty space filled with loads of empty tables. How were we going to fill this room with people? Well, come eight o’clock that night, we let the ticket holders in. I was at the front door greeting people all evening and sending them on their way toward that gigantic dining room. Ed and Anthony Ingrassia were at their positions taking care of all the problems—and there were many, believe me. Meanwhile, none of us had moved from our work spaces. So, now it was time for us to clean up our end and find our tables. When we finally walked through those big double doors, we saw a room that had gone from immensely empty just a few hours before to a place teeming with people, many sitting at their tables but lots more also roaming around saying hello to friends. As an aside, we had invited the New York Giants and our roastee, their coach John McVay, as well as other athletes from other teams. We sprinkled them throughout the room seating them at the various tables and on the dais. It was astonishing. And exhilarating. And we netted $250,000 for the evening. WE HAD DONE IT! THE VALERIE FUND was off and running. Yes, we HAD done it. And we knew it was time to continue our mission of placing VALERIE FUND CHILDREN’S CENTERS throughout New Jersey. And on July 1st, our seventh Center, St. Joseph’s Children’s Hospital in Patterson, New Jersey will open for business! And let’s not forget THE VALERIE FUND’s wonderful CAMP HAPPY TIMES in Tyler, PA. It’s a free one-week overnight camp for children with cancer. Your support throughout the years has made all this possible. THE VALERIE FUND CHILDREN’S CENTERS for Cancer and Blood Disorders form the largest network of hospital-based outpatient healthcare facilities in New Jersey and is now one of the largest in the nation. We have a fabulous medical and support staff caring for our children and their families and they supply that extra ingredient … LOVE!! What does all this add up to? Well … I’m going to tell you. I met two VALERIE FUND CENTER moms a while back. One had a son diagnosed at five with leukemia; he’s eight now and a year off treatment. The other mom’s son was diagnosed at 20 months and he’s still on treatment. They’re very young, these moms. And they talk about THE VALERIE FUND as if it were responsible for everything good in the world. And so, the children thank you, their families thank you and we thank you. From the bottom of our hearts. Thank you for your continued support. If you have any questions or want to volunteer, come up and talk to us. Come up and talk to us anyway!